I was happy about being at the top of the Hall of Fame, but then I realized it just puts the most recent winner up there. My failure to win the first time hadn’t been eating at me, but we’re going to be looking at PLATO again in the coming year, with Swords & Sorcery (1978) and Camelot (1982). We’re also going to be taking yet another look at the DND line, as a helpful commenter has recently provided me with the ability to play a 1977 VAX edition of Daniel Lawrence’s game. Before we did all of those things, I wanted to take another look at the game that started it all. 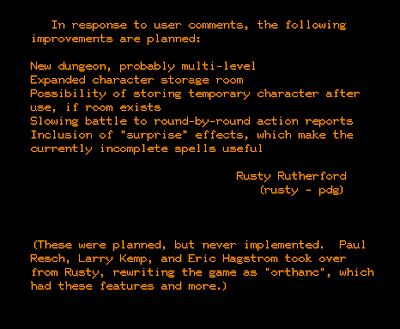 In doing so, I’m going to cover it from scratch, as my 7-year-old original entry on The Dungeon has some erroneous information. 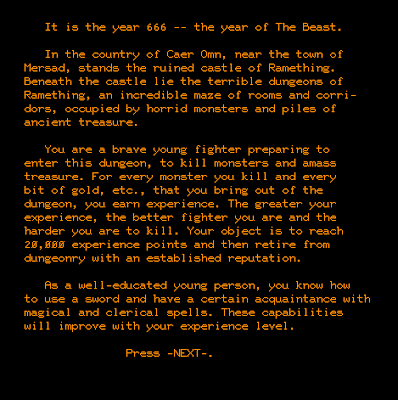 The Dungeon is the earliest-known RPG that still exists, and it may in fact be the earliest period. Legend tells of a game with the lesson name m199h that preceded it and was deleted. (In the early days of PLATO, system administrators relentlessly purged non-academic lessons, until it occurred to them that students were actually learning something by programming games.) 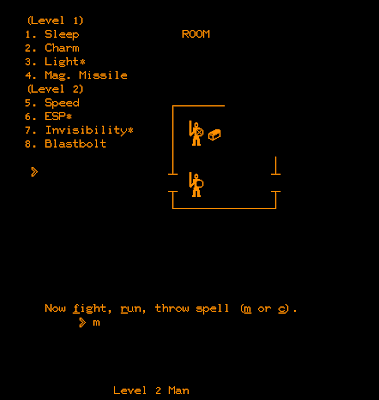 However, I’ve been in correspondence with an early PLATO developer, Donald Gillies, who recalls that The Dungeon came first and that m199h was a contemporary of the later Game of Dungeons (more popularly known by its lesson name, dnd). Whatever the case, clearly all of these games were written just about as early as a computer role-playing game could possibly be written, as tabletop role-playing games had only existed since the release of Dungeons & Dragons a year earlier. Their near-instant appearance on PLATO, particularly in the complexity of games like Moria and Avatar, is a testament to the power of PLATO and the willingness of dozens of students to sacrifice their grades in favor of slaying orcs. An unnecessary but well-written backstory. An inexperienced player would fret during character creation, but I honestly don’t think the attributes matter much. As we’ll see, winning the game is more about stumbling upon treasure than fighting battles, and to the extent that you have to fight battles, winning is more about spell choice than character attributes. Even with an experienced player, a Level 1 character has about a 95% chance of dying within 5 minutes, and death is permanent, so it would be a waste of time to keep quitting the lesson and re-entering so you can re-roll higher attributes. The only character creation options you get. 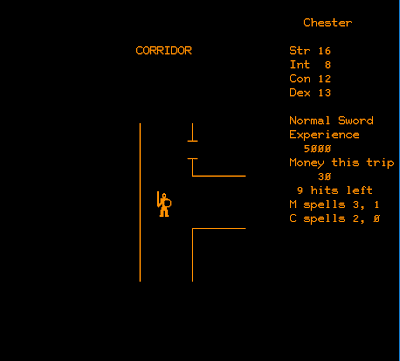 Every time you create a character, the dungeon’s rooms are randomly seeded with monsters and treasure. 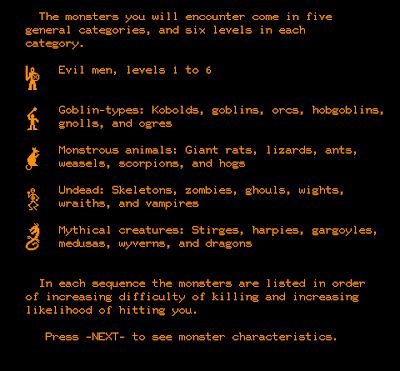 You also have a 1/24 chance of encountering a monster for every step you take. Monsters come in six categories–evil men, goblin-types, monstrous animals, undead, and mythical creatures–and they can be any level from 1 to 6. Everything after that is mostly random. (Some notes suggest that higher-level monsters may be more common as you get further from the entrance; if so, the effects are subtle.) Two steps into the dungeon, you might encounter a Level 6 dragon or a Level 1 kobold. You have no chance of defeating the former. 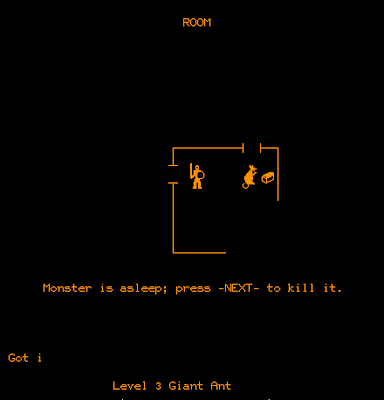 You have no chance of defeating about 1/3 of the monsters you might encounter at Level 1, in fact. Melee combat is the sucker’s way out. I didn’t realize this the first time I tried it. You don’t even get to see your attack rolls or damage. When you choose to fight, the game simulates the entire battle and tells you the outcome, and the outcome is almost always that you lose. This is true even after you’ve gained a few character levels. A smart player hits (F)ight only as a last resort. Success in combat is almost entirely about spells. There are 16 spells in the game–four each of Level 1 and 2 cleric and magic-user spells. You begin the game with a single Level 1 magic-user slot. At 1,500 experience points, you gain a first-level cleric slot. At 2,500, you get a second Level 1 magic-user slot. At 5,000, you gain a second-level slot for both classes. At the highest level before retirement, you have 4 first level and 2 second-level magic-user slots and two first and second-level cleric slots. Some of the spells depend your intelligence for their power, but many are entirely deterministic. For instance, “Sleep” (M1) works 100% of the time on non-undead enemies who are Level 4 or below. “Hold Person” (C2) works 100% of the time on humans and goblin-like creatures of any level. The effects of many of the spells, like “Continual Light” (C2), “Protection from Evil” (C1), and “ESP” (M2), are hard to see, and thus I tended to never cast them. This is a game where you always want to favor the sure thing over the variable. “Sleep” is an auto-kill for Level 4 enemies and below. The worst enemies are undead. There’s no “turn” spell and nothing that works 100% of the time against them. “Sleep,” “Charm,” and “Hold” don’t work at all. “Magic Missile” (M1) is supposed to do double damage against undead, but it often doesn’t kill them. “Blastbolt” (M2) more reliably kills them, but not always. Encountering any high-level undead is practically the same as a “game over” screen. As you gain experience, you learn the rules. If the creature is Level 4 or below and not undead, cast “Sleep.” If it’s above Level 4 and a humanoid, cast “Hold Person” if you have it, “Charm” if you don’t. If, gods forbid, it is an undead, cast “Blast Bolt” if you have it and “Magic Missile” if you don’t. If the enemy is a mythical creature above Level 4 and not a dragon, cast “Dispel Myth.” If it is a dragon, do whatever you want because you’re dead regardless. The game benefits from excellent documentation, which was stored in lesson pedit4. Above all, once you’ve won the battle, head back to the exit, which restores all of your spell slots and hit points. Yes, that means even if you’ve only used a single spell slot and you still have several. In this game, you want to be exploring with all your resources, all the time. You also want to head for the exit every time you find treasure, because the experience points that you get from treasure aren’t awarded, and your new level not calculated, until you leave the dungeon. Yes, exiting also saves the character and logs you out of the lesson, but trust me, having to log in again is the least of your worries when trying to win this game. The single equipment upgrade. Doesn’t help much if you know what you’re doing. Winners don’t fight. Winning mostly comes down to fighting treasure rather than winning combats. It’s supposedly more prestigious to win with all of your experience from combat, or at least a lower treasure/combat ratio, but it would take a long time. The average experience reward from combat is around 100 points, so you’d have to win 200 of them to get the full experience quota. What with having to leave the dungeon every time your spells or hit points get low, that could easily take 10 hours, and of course the odds are that you’d never last that long. 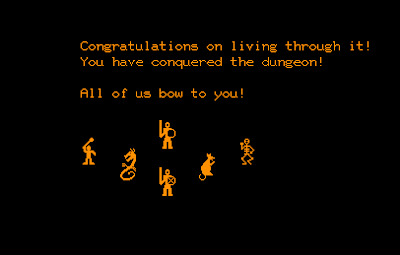 This, especially in an early room, is the most joyous moment in the game. Treasure is what saves you. 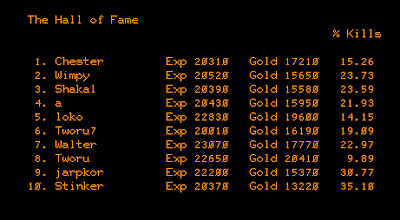 On the Hall of Fame after I won, the most hard-core player got 35% of his experience from combat; the lowest got less than 10%. I was at 15%. Treasure can come in the form of silver, gold, gems, and jewels. (You can also find magic swords, but they only help in melee combat.) Silver and gold might give you 20 or 50 experience points per “find,” but a jewel can easily be worth 4,000 gold pieces. If you’re lucky enough to find a few jewels early in the game, close to the entrance, your day is made. 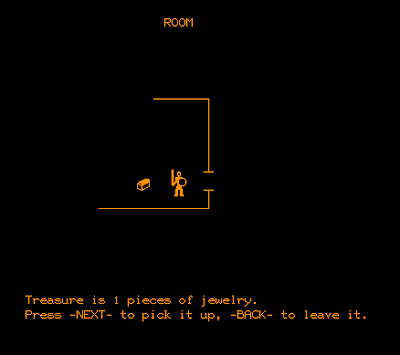 Treasure is only ever found in rooms, so a smart player starts (B)ashing down doors immediately. 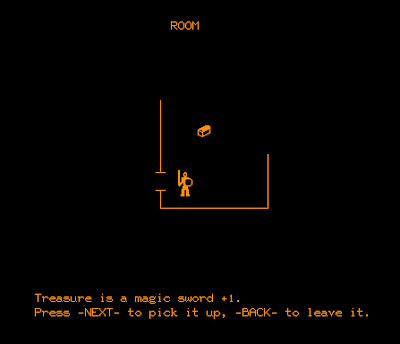 If you find a 4,000-experience point jewel in the first room, you can head for the exit immediately, and when you re-enter, you’ll have 3 hit dice instead of 1, plus several levels of spells. The game is much easier after that. I nearly won a second time with this “Chester,” who I created just to get a few more screenshots. I got lucky with a 5000-gold piece jewel in my first room. He ultimately died with over 15,000 experience points after I got too cocky deeper in the dungeon. I didn’t understand many of these things the first time I played, but I was encouraged by Nathan Mahney’s (“CRPG Adventures”) 2014 victory as well as Ahab’s more recent win over at “The Data-Driven Gamer.” Nathan, incidentally, deserves a lot of credit for mapping the entire level of the dungeon despite a victory requiring nowhere near that level of exploration. I didn’t get nearly as far. But I did get into the Hall of Fame–at least until the next 10 people edge me out. Ahab’s character (“a”) was still on the list from his November 2018 win, although two people had won in the meantime. I needed to map less than half the dungeon before I won. 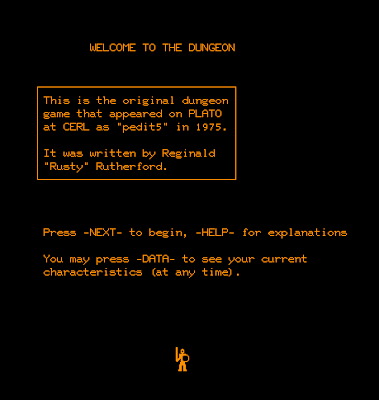 The Dungeon was programmed by Reginald “Rusty” Rutherford III, a (then) 35-year-old doctoral candidate at the university. Mr. Rutherford told his story to Matt Barton in a 2008 article on Armchair Arcade. The file name pedit5 was just one of many allocated to the Population & Energy group. Rutherford wrote the game in 4-6 weeks while his fellow Dungeons & Dragons fans were working on the more complex Game of Dungeons. News of The Dungeon spread by word-of-mouth, and it soon became popular enough that the stored character limit (he says 20 in the article, but it’s currently 30 in the Cyber1 system) became a serious issue. Some of the changes that “Rusty” planned. Rutherford planned several upgrades to the game, including multiple levels and a round-based combat system, but he left the Population & Energy group the following year and never got to implement his ideas. The game, meanwhile, was deleted, although somehow a copy was saved and later restored. After its initial deletion, its supporters put their efforts into Orthanc (1975), a more complex game in the same spirit, which I covered in 2013. All of you must bow to me. In my original GIMLET for The Dungeon, the game scored an 11. Looking over the scores now that I’ve experienced the entire thing, I think I was too harsh on character development, combat, and economy, all of which got a 1 originally but were bumped up to 2 with this replay, bringing the new total to 14. I also lowered the difficulty from 4.0 to 3.5. The monsters are still very deadly, but now that I know how easy it is for luck to come along and save you with a treasure haul, it’s a little less punishing. This article didn’t really add anything new to our understanding of The Dungeon, particularly after Nathan and Ahab’s coverage, but it does allow me to turn a loss into a win. Plus, it reminded me how Cyber1 and PLATO work, setting the stage for some of the games we’ll cover later this year.